Oxley Shire (1865-994) in north-east Victoria extended from Wangaratta southwards to Mount Howitt at the crest of the Great Dividing Range. Its east-west dimension was from Greta to the foot of the Mount Buffalo plateau. Its area was 2789 sq km. The shire was named after the Oxley Plains, an agricultural area south of Wangaratta. The plains were named by the explorers Hume and Hovell in 1824 after the New South Wales Surveyor-General, John Oxley. The Oxley Plains were occupied by the overlander/pastoralist, George Faithfull, in 1838. Within a few years most of the future Oxley shire was taken up by pastoral runs. The Oxley Plains were a crossing place for miners en route to Beechworth and the north-east goldfields from 1852. A township was reserved at Greta in 1853. The Oxley Road District was proclaimed in 1862 and the shire was proclaimed on 11 December 1865. The administrative centre and meetings of the Road Board and Council were centred on the Emu Hotel, Milawa, until a shire hall was opened in Oxley in 1875. The Kings and Ovens Rivers frequently flood, and the shire expended much of its revenue on bridges. Flooding continues despite the William Hovell water storage (1971) on the King River. When the railway to north-east Victoria was taken through Wangaratta (1873) traffic though the north of the Shire was lessened. A southwards narrow-gauge railway, mainly for carrying produce and timber, was opened between Whitfield and Wangaratta and ran from 1899 to 1953. 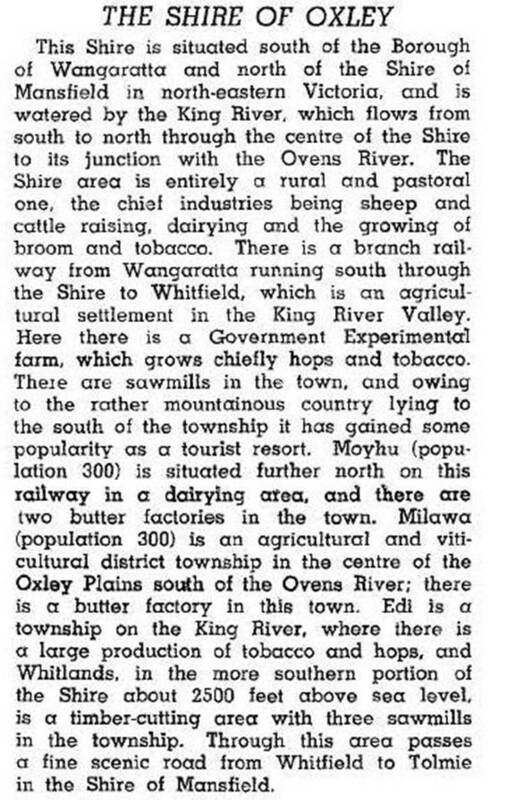 Oxley shire had a wide range of agricultural activities. In 1994 the shire had 11,000 dairy cattle and 67,000 meat cattle. Sheep and lambs numbered 50,500. About 550 hectares of vineyards were near Milawa on the Oxley Plains. About half of the shire's area was under agriculture. On 18 November 1994, most of Oxley shire was united with Wangaratta city and shire and parts of Beechworth, Benalla and Yarrawonga shires to form Wangaratta Rural City. Cheshunt, Edi, Greta, Milawa, Moyhu, Oxley,Whitfield and Whorouly entries.